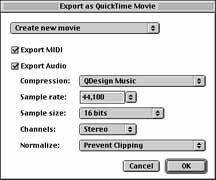 Features include Power Mac native code, full support for Digidesign TDM bussing, advanced DSP features, enhanced integration with Apple's QuickTime and support for all major audio file types. Included are grooves in audio and MIDI format and other enhancement utitlities. While SVP 4.5.1 has TDM support and will support most Digidesign products, it will not interface with Digidesign 001. SCSI hard drive (most new Macs have IDE, so it may need to be external). 16 MB RAM minimum application space (>16MB preferred). 5 MB disk space per minute mono for audio recording/editing. ASIO compliant or Digidesign audio card recommended (but not required). Support for CBX will not be in the initial release of SVP but will be added back in with the 1 update. Supports VST compatible real time effects. 4 DSP plugin Inserts available per console strip. EQ Edit window with graphic representation of EQ curve. Support for ASIO compatible sound cards. 8-24 bit support in DSP and playback. Displays CPU, RAM and Hard Disk performance graphically. All preferences combined into one window called "settings". Template files for saving settings externally. Saveable Templates for VST banks and programs from within effect edit window. Multitrack, multinote step editor makes adding notes to a rhythmic grid easy. New tool- Magic Drumstick for mass inserting or deleting of notes. New built in arpeggiator that uses new playback quantize for rhythm. Toggle to display strip chart in Track Overview or Pulse Editwindow. User choosable textures forwindows and dialogs. Map key equivalents for everything including DSP and Premiere functions. .
4 Aux sends available for each strip. Preference to view instrument colors on console fader. Smart overdub so consoles or controllers can be recorded without destroying note data. Support for ASIO compatiblesound cards. Recording from anywhere in the audio chain directly. Select Unused - allows selection of all unused audio events in file. Stereo file support in all DSP including Premiere styleplug-ins. Ability to import/export new QuickTime 3.0 types. Improved zooming and expanded waveform for tight edits. DSP processes on selected audio. Auto naming of files option toimprove speed. New Crossfades dialog withmaximum control. Open button on Control Bar will display info without Performance Window being open. Multitrack, multinote step editormakes adding notes to a rhythmic grid easy. Columns can be hidden, resized or reordered. View multiple instruments in onewindow. Each line is a specifc note number (view can be set to only show lines with data). Set playback quantize individually for each track. Quantize can be set to groove or grid. Velocities can be shown by height in grid. Velocities can be edited by dragging top of note. Can edit all selected note dataat once. new playback quantize for rhythm. Both effects can be synced to sequence counter. Arpeggiator features Up, Down, Random, Alternate and Latchmodes. Repeat input extended to follow playback quantize. Or, effects can be run withoutsequence playing. Toggle to display strip chart in Track Overview or Pulse Edit window. All edits apply to selected tracks. values between upper and lower limit. Continuous controller oscillating tools for creating gating sweeps. Zoom in into specific areas for fine edits. Legato changes- extend releases into next attack or shorten notes for zero overlap. Now includes audio in selection criteria. Ability to edit by any command available in Strip Chart. Works across all data in sequences, segments and tracks. Command to Batch assign faders to controller and vise-versa. Now a window instead of a dialog so it can be open at all times. Settings can be saved as a Template. Drum Map transpose "Add To" button to easily create harmonies and echoes. User choosable textures for windows and dialogs. Reworded and redesign of all dialog features for clearer, easier use. Redesign of all windows and dialogs. New resizable large counter window with ability to choose font, size and display. Cursors move ahead on paste for faste repeat pasting. Ability to overwrite controller data without losing notes. Bar limit increased to 9999 from 999. Playback quantize to any value including grooves. Quantize on input to any value. Grooves can be pasted and copied within any file. New templates for remembering settings. Sequence window redesignedwith moveable columns. Loops can be rounded to the nearest bar or set to start/end at any point. Mute both MIDI and Audio events. Create and name Segments from a simple dialog. Editing segment will edit all instances that reference it. Loops can be graphically resized and set. Double clicking on segment will open up default edit window instead of Track Overview. Map key equivalents for everything including DSP and Premiere functions. Command-arrow keys nudge pitch (up/down) and attacks in time (left/right). Redesigned window for MIDI keys. Pitch can be nudged by semitone, scale degree, map or octave. A key command to cycle around the cursor tools in each window. Time can be nudged by units, metrically or SMPTE. A select next tool command. Nudge settings are user definable.